I’m happy to introduce Bryana Piazza, today’s guest dietitian, who will be sharing expertise on protein in a plant-based diet. I love Bryana’s devotion to plants, and her post is a great reminder to us all to eat more of them. I’m also drooling over her stuffed mushroom recipe below! Hi everyone! I’m Bryana and I am a registered dietitian from San Diego specializing in weight management. I have been a vegetarian for the past 20 years or so, and I recently made the switch to a vegan diet. I want to start off by saying that this post is not intended to shame people into adopting a vegan lifestyle, as I believe that everyone is entitled to their own dietary preferences and personal beliefs. Personally, I prefer to use the term plant-based in regards to my diet versus saying that I am a vegan. One reason that I prefer plant-based is because there are some vegetarians and vegans out there that barely eat any plants at all. Their meals include processed and pre-packaged foods such as mock chicken, with long ingredient lists and little nutritional value. I prefer to fill my plate with fresh fruits and vegetables, nut and seeds, whole grains, and legumes. Also, I like a plant-based diet because even those that do enjoy meat can follow a plant-based diet! As a registered dietitian, I do not recommend to my patients to become a vegan or vegetarian, as this is unrealistic and not something that everyone wants to do. Instead, I recommend that they follow a plant-based diet, meaning to make the star of the meal the plants, not the meat. Everyone can use more vitamins, minerals, antioxidants, healthy fats, and fiber, all of which come from plants. From my experience as a registered dietitian, I have found that people are open to adding plant-based meals into their diet, however, are concerned that they are not getting adequate protein from these types of meals. Thus, the intention of this post is to share some plant-based protein sources to include in your meatless meals! Hemp seeds, sunflower seeds, walnuts, cashews, hazelnuts, macadamia nuts, almonds, etc. As you can see, it is relatively easy to meet your protein needs by eating plants! 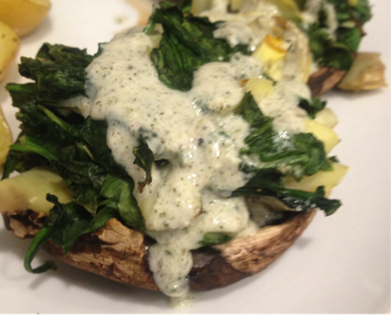 Below you will find a delicious stuffed mushroom recipe that is packed with plant-based protein for you to try as your next plant-based meal! I ended up serving my mushrooms with roasted yellow baby potatoes and roasted green beans. The hemp dressing is full of protein and healthy fats to keep you full and the mushrooms are a great meat substitute due to their texture. The total protein content per serving of this recipe is 20 grams, which is more than 1/3 of the average persons needs. I hope you enjoy these mushrooms as much as I do! 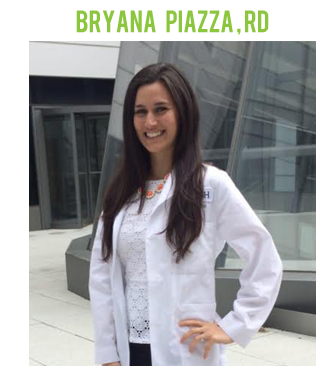 Bryana Piazza is a registered dietitian living in San Diego, CA. Bryana received a bachelors degree in Food and Nutrition from San Diego State University and a masters degree in Clinical Nutrition from Rush University Medical Center in Chicago, IL. Currently, Bryana works as an outpatient dietitian for a surgical weight loss and medically supervised weight loss program. Bryana follows a plant-based diet and believes in eating real, whole, un-processed foods! In her free time, Bryana loves to cook, stay active through hot yoga, running, and weight lifting, and spend time with her fiancé and two cats! Contact Bryana at [email protected]. 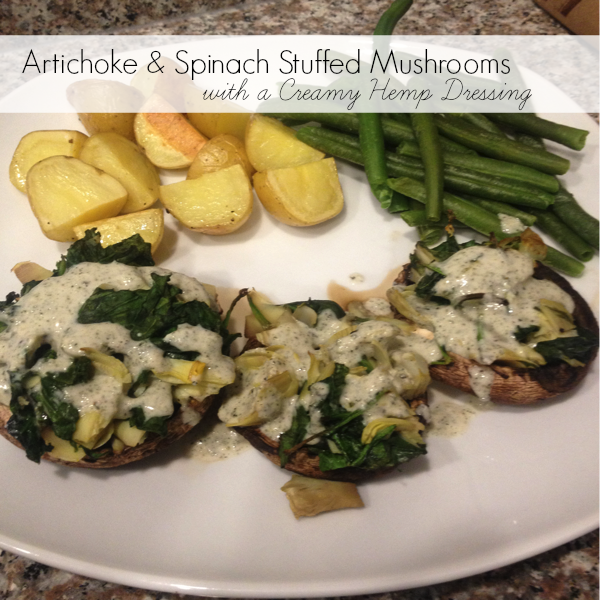 I am a huge stuffed mushroom fan! I love stuffing them with canned salmon or tuna! The dressing on these looks amazing. Using miso in dressing adds such great flavor. I love adding miso to dressing not only for flavor but also for gut healthy probiotics that it adds! Exactly! The recommendations definitely change based on activity level. That mushroom recipe looks delicious! I loved the picture with the protein amounts for each of the types of food- super helpful! I love this! I definitely try to reach for more plant-based foods, but sometimes it is hard to do with all the other yummy distractions. I feel so much healthier when I eat whole foods, awesome reminder and great post! Great post – love the graphic! Question: When trying to lose weight, do you eat the protein for your current weight or the weight you want to be? What if it is a significant amount of weight you need to lose – does that change anything? Protein recommendations can change for significant weight loss. For example, for my surgical weight loss patients, I recommend 1.5 g/kg of protein. Not only do these patients did extra protein to help heal from surgery, but also to help preserve muscle tissue as these patients lose a lot of weight very quickly. I love these RD posts! Question: are there any real negative consequences of too MUCH protein? There are some studies that do show an association of eating too much protein and kidney damage. However, many of the studies differ in the amount of protein that is considered unsafe, thus, there is currently no maximum amount that has been established. I would suggest to stay within the recommendations taking into consideration your age, activity level, and any health related conditions that you may have. Great post! I do have a question for Bryana as I am also a Surgical Weight Loss Dietitian-While the protein needs of an average individual are ~0.8g/kg, what do you estimate as the needs for your surgical weight loss patients as they are losing weight quickly and are healing from surgery? For my bariatric patients I do recommend a higher amount of protein versus the average individual due to the reasons that you mentioned. I typically recommend up to 1.5 g/kg or tell my patients to aim for at least 70 grams per day. This is an awesome post! I am wondering, however, how activity level affects your protein needs — how much more do you need based on how much you workout? I know that now I hardly reach the minimum and I am pretty active so I don’t want to be getting too little! Yes, activity level should be considered when estimating your protein needs. Depending on the type of activity you do, the intensity, and duration, your protein needs will differ. The recommendations can range from 0.8-1.2 g/kg for the typical active person all the way up to 1.7 g/kg for a competitive athlete. Thanks for the post. In our information-inundated age, I remember coming across information on different types of proteins. I think one was the “complete protein” and the information suggested the main (only?) way to get it was through meat. Is that accurate? If so, are any of the proteins you’ve listed here complete proteins and is it important to eat more of those? Complete protein refers to a protein source that contains all of the essential amino acids. Majority of plant-based foods are not considered complete proteins because at least one of the essential amino acids is missing. In the past, it was recommended that you combine different plant-based proteins in one meal to ensure that you receive all the essential amino acids. However, new studies suggest that your body can utilize all of the amino acids that you eat through out the day. So, as long as you eat a variety of plant-based proteins, you most likely will be able to receive all of your essential amino acids. This is very helpful! My son is lactose intolerant, my husband watches his carbs and I don’t love meat so we find that plant based/ vegan dishes are the easiest for us to cook and please everyone in the family. I’m always looking for new recipes and I can’t wait to try this out. I’m also glad you touched on soy. I love tofu and soy milk so I’m sometimes afraid I get too much soy. I like that you talked about the difference between soy isolates and whole soy. This makes me feel much better! Thanks for the protein chart. We try to go meatless once a week! Hey, Kath! What is the new Newsmax Health thing on your sidebar? Looks interesting. It links to health news across the internet. Its one of my sponsors. Yum – those mushrooms look amazing! I try to eat plant-based diet and always love hearing about different protein sources available through plants. I don’t obsess over it, but am definitely conscious of my plant protein intake. I love that you featured a vegan/plant-based dietitian. So cool! The recipe looks great! Awesome point about eating nutritious veggies and plant based food vs. being “vegan or vegetarian” – what an awesome perspective. This recipe looks great – definitely something I would make! Very informative post. Have been looking for more ways to serve less meat dishes at home. But was always concerned about not enough protein. This info really helps. Thanks for a recipe suggestion! We see strokes, high blood pressure, asthma, heart attacks, diabetes and even cancer all written off as “part of getting old” rather than being called what they truly are: symptoms of poor diets. When you give your body something it has a hard time processing, like animal products or processed food, there’s nowhere for this stuff to go. That’s because you’re giving your body foods that are really difficult for it to break down, they just sit there.. A steak can take up to 3 days to digest. Think about what would happen if you left your steak on the counter for 72 hrs . It would rot! And your body is not refrigerated. So now it;s sitting in you decaying. Your body doesn’t want it and to gunk up your organs your blood stream , and so it hides it. Just tucks it away where no one will see it. It’s like that closet or junk drawer you shove everything into when people come over. As long as nobody tries to open he door or drawer , everything will appear fine. This was a really great post she put together!! I love her perspective on it all too!! I think I prefer saying I’m plant based also because of the emphasis on greens in my diet (hence my blog name haha!). And seriously, I would wear a ‘Kale’ shirt around all day – super dork alert!! I love this post! I juggle a lot with a plant-based diet even if I sometimes eat meat and dairy. I feel my best when I eat a mostly plant-based diet anyway so it encourages me to continue! Thank you and I hope to see more plant-based guest RD. I love the fact that you have posted about plant based protein, my question is are these complete proteins? I was always taught that you needed to combine foods as a vegetarian to get complete proteins like beans and rice. Is this true?